Intake Valve, 2.020'' x 4.903'' o.a.l. Intake Port Gasket, 1.280'' x 2.100'' w/ 3/8'' radius Fel-Pro 375-1262 - DO NOT PORT MATCH Intake Manifold to Fel-Pro Gasket. Suggested Manifold RPM Performer, Victor Jr. The Ultimate Bolt-On Emission Legal Street/Strip Weapon! AFR's NEW 185cc Renegade Ford cylinder head is a total redesign of their already formidable and proven 20° Ford cylinder head. This new 185cc flow drastically more, averaging a 17 CFM increase from .200-.600 lift, than the previous best 185cc heads. If you're looking for a decisive advantage for your small block Ford street/strip car, check out AFR's all new 185cc intake port emissions legal (CARB EO #250-3) performance cylinder heads. With lightweight 8mm diameter stem, 2.020'' intake valves, 1.600'' exhaust valves, volumes of 58cc, 60cc or 72cc combustion chambers, and 70cc exhaust ports, AFR's new 185cc Ford cylinder heads are designed for 302-367 cid engines operating from 1500 rpm to 6500 rpm. A 3/4'' thick head deck makes the AFR head ideal for nitrous or blower applications. Will not accept rail rocker arms. 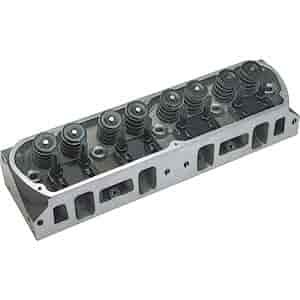 Hardened pushrods required with cylinder heads p/n 033-1420 and 033-1422. High flow 2.020'' valves might require aftermarket pistons notched for valve clearance. . Installation Note: 1986 5.0L must have pistons notched for clearance. Click image to enlarge Emission legal cylinder head features 5/8''-11 through hole used for connecting emissions equipment (firewall side). Requires supplied thermactor reducer (x2) to mount alternator/accessory brackets. Confirm orientation of plug prior to installing cylinder head.